Courtesy of a gift from a locally based financial advisory firm, students enrolled in business majors at Pennsylvania College of Technology have access to Barron’s Digital subscriptions, as well as a variety of resources provided through an experiential learning initiative offered by the Barron’s in Education Program from Dow Jones. Hudock Capital Group is providing a two-year gift to Penn College to be licensed for the program. Also benefiting from the program are business faculty at the college. The Pennsylvania Institute of Certified Public Accountants named Michael D. Shipman, instructor of business administration/accounting at Pennsylvania College of Technology, among its 2018 Young Leader Award recipients. Through its Young Leader Awards, the PICPA annually recognizes members under the age of 40 who demonstrate a commitment to the accounting profession through their participation in PICPA or community volunteer activities. This tax season, 13 Pennsylvania College of Technology accounting students helped clients file close to 150 federal income tax returns. The free service is part of the Volunteer Income Tax Assistance program sponsored by the IRS. It is designed to help taxpayers who have relatively uncomplicated returns to prepare their returns and file electronically. The returns yielded almost $200,000 in refunds for the taxpayers who participated. Pennsylvania College of Technology accounting faculty members recently presented a session on income tax returns – and the assistance available to file them – at Thrive International Programs in Williamsport. Michael D. Shipman, instructor of business administration/accounting, and Bob Nolan, part-time instructor of accounting, provided an overview of the federal income tax system, who should file an income tax return and why. Shipman and Nolan are also the Penn College site administrators for Volunteer Income Tax Assistance, a free, IRS-sanctioned service to help the community file personal income tax returns. Pennsylvania College of Technology students offered free assistance to about 160 taxpayers this spring, helping them to realize close to $170,000 in income-tax refunds. Sixteen Penn College students took part in the Volunteer Income Tax Assistance program, an initiative of the IRS that offers free tax help to people who generally make $54,000 or less, or those who may need assistance preparing their own returns because of a disability or language barrier. All but two of the students are enrolled in the course Income Taxation of Individuals, taught by Michael D. Shipman, instructor of business administration/accounting. They are pursuing degrees in accounting, legal assistant paralegal, and business administration: banking and finance concentration. Penn College grad Paul R. South (in red hard hat) leads students on a tour of Danzer Veneers log yard. Pennsylvania College of Technology student Kalee A. Holdren was selected from among her peers to serve as the Pennsylvania Institute of Certified Public Accountants’ student ambassador to the college. As a student ambassador, Holdren encourages other Penn College students to become members of PICPA, promotes the institute’s programs and scholarships, and works with Penn College Accounting Society President Morgan E. Blackwell, of Beech Creek, to encourage students to attend PICPA events on or near campus and to involve the Accounting Society in the institute. A mix of students, community members and past Colloquia speakers are on hand for Ebersole’s instructive talk. 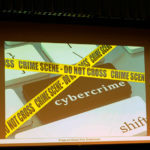 An Internet crimefighter and part-time accounting instructor at Penn College, speaking Tuesday in Klump Academic Center Auditorium, advocated “cyberhygiene” to protect our billions of connected devices – and our personal information – from being compromised. William E. Ebersole delivered the final lecture in the 2016-17 Technology & Society Colloquia Series, “Cyberattacks: The Weapon of Choice of Criminals, Terrorists and Spies.” Recalling the mid-1980s movie, “War Games,” in which a teenager nearly brings about nuclear catastrophe by accidentally accessing a military supercomputer, he said real-life hackers are much more focused, persistent, deliberate and sophisticated. And after several examples of their nefarious handiwork, including a widespread credit-card breach at Target stores and a three-day interruption of electrical and telephone service in Ukraine, Ebersole provided valuable counteractive tips. That advice included using strong passwords and changing them often, limiting what information is posted online, watching for unauthorized devices connected to home networks, being vigilant about children’s web activity, and keeping current on upgrading software and installing security patches. Ebersole had high praise for the college’s information assurance and cyber security curriculum, which he said is helping to feed the growing need for competent technicians. Whatever their major, though, he emphasized that all students can practice safe computing, and he especially urged them to consider the ramifications on viable job-seekers from the Internet’s long-term memory. “Don’t put something crazy on social media to knock you out of the picture,” he said. Pennsylvania College of Technology students set an impressive record during their fall-semester participation in the Business Strategy Game. In all, Penn College student teams earned spots on the international game’s weekly Top 100 lists 21 separate times. “This is quite impressive given that, at some point during the semester, over 5,700 teams competed in the BSG,” said Chip D. Baumgardner, associate professor of business administration/management. Can’t sell your textbook? Donate it! Penn College’s Accounting Society is running a book drive on behalf of Better World Books, an organization that aims to improve global literacy. Watch for the green collection bins at such campus locations as the Breuder Advanced Technology and Health Sciences Center, Klump Academic Center, and the Keystone Dining Room. “If you cannot sell your textbook, placing it in one of the bins will ensure the book is recycled for use by someone in need,” said club adviser Michael D. Shipman, instructor of business administration/accounting, “and the Accounting Society will receive $1 for each book in its only fall fundraiser.” The drive, organized by organization President Stephanie J. Michaud, of Linden, will run through the end of Finals Week. Panelists (from left) Lisa M. Andrus, part-time instructor of business administration/management/marketing and owner of Andrus Hospitality; Samuel Ryder, vice president for FNB Bank and a member of the college’s Business Administration Advisory Committee; and alumnus Scott D. Rinker, ’12, branch manager for Jersey Shore State Bank. Ryder talks about his schedule and the importance of getting involved with community. Penn College graduates Ryan M. Enders, ’13, a field service representative for Lycoming Engines; and Tracy L. Schroeder, ’13, a project coordinator for InCourage Financial Wellness. Schroeder talks with students about her work in a nonprofit. Students listen to working-world advice from business graduates and other business professionals. Anthony L. Peachey talks with students about the importance of networking in a crowded job market. A group of business professionals – including four alumni – attended a recent mixer with students in Penn College’s business majors. In addition to chatting over hors d’oeuvre, the pros offered a panel talk in the Student and Administrative Services Center Presentation Room. They offered lessons they’ve learned in navigating their careers and advised students on such practical tips as submitting resumes, networking, and managing work-related stress. Panelists were Ryan M. Enders, ’13, technology management, and ’11, aviation technology, who is a field service representative for Lycoming Engines; Tracy L. Schroeder, ’13, business administration: banking and finance concentration, who is program coordinator for InCourage Financial Wellness; Lisa M. Andrus, part-time instructor of business administration/management/marketing and owner of Andrus Hospitality; Samuel Ryder, vice president-group manager for Fulton Financial Corp./FNB Bank; Scott D. Rinker, ’12, business administration: marketing concentration, who is a branch manager for Jersey Shore State Bank; and Anthony J. Peachey, ’09, business administration: marketing concentration, who is product manager for Construction Specialties Inc. and holds LEED Green Associate certification.